Join us as we explore, investigate, and solve problems. 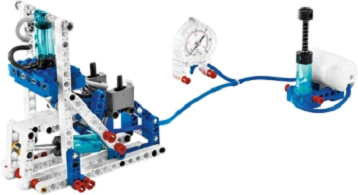 This exciting, hands-on engineering class combines LEGO Education and LEGO Technic materials to study design technology, science, and mathematics. Students will be building learning models and challenged to customize and improve their projects with what they have learned. We will investigate the principles of design, mechanisms, pneumatics, pressure, prototyping, energy, and much more. Possible projects include Scissors Lift, Stamping Press, Robotic Arm, Robotic Hand, Animatronic Scarecrow, and Dinosaur. LEGO® is a trademark of the LEGO Group of companies which does not sponsor, authorize, or endorse this site or program.